As co-creator of Found Magazine, Jason Bitner’s got a soft spot for other people’s stuff, with one caveat: “With found objects, your fantasy version is always different, and probably better, than the reality of the situation.” Still, when Bitner stumbled on a cache of 18,000 photo studio proofs in the back room of a restaurant in La Porte, Indiana, he couldn’t turn away. The photos were taken by Frank Pease in his Muralcraft portrait studio, and completely documented the town in the ’50s and ’60s. To Bitner, they were absolutely mesmerizing—and mysterious. He wanted to know who the people were, where they came from, and where they were today. He ended up hanging out in town for three weeks going through the photos, handpicking 300 favorites that were ultimately compiled into a book: La Porte, Indiana. Flash forward four years, and Bitner’s just produced a movie—also called La Porte, Indiana—making its Chicago premiere at the Gene Siskel Film Center Oct. 7. The A.V. Club talked to the honorary La Portean about the filmmaking process, the importance of photo prints, and why this film is his love letter to the Midwest. A.V. Club: How did La Porte, Indiana go from a book to a movie? Jason Bitner: After the book came out, I sent a copy to the diner where we found all the photos. People would flip through it and find themselves, their grandparents, teachers, whoever, and whenever someone was identified, they’d put the name on the photo, or if that person was still around, they’d autograph and put their contact information on the photo. It became like a town yearbook. One of my friends from the Chicago Tribune got curious about where all these people were now, just like I was, so we went to La Porte and got that contact information, and started calling people. Their stories turned into a radio story for NPR, and as soon as I heard all the voices come to life, I knew I wanted to make something a little more in-depth and visual. The voices made everything come to life and made the book almost a mini-portrait of the town and not just an individual, but I wanted to be able to see the people, not just hear their voices. AVC: What was your next step? JB: I’d been talking to my friend, director Joe Beshenkovsky, about doing a project together for some while, but the timing never worked out. We went to breakfast, though, and I’d just finished my book, Cassette From My Ex, and he’d just finished working on the movie Objectified, and we decided to just do this thing. A few days later we were in La Porte, ended up talking to people for a solid week, and at the end of that time, we knew we could make a movie. So, we hired a camera guy and saw what we could make. AVC: Did you have pre-set goals going into the project? JB: The whole thing was intended to be a love letter to the Midwest. I’m from Chicagoland originally, but I’ve lived on both coasts, and would always hear snarky remarks about growing up in the Midwest. There just weren’t that many loving tributes to home available, and I ended up getting very defensive. I wanted to make something special to celebrate the culture of the Midwest without being too glossy about it. I just wanted it to feel really real. The book did that in a way, presenting the photos without opinions or commentary, but the film allows people to tell their own stories. AVC: Where in Chicagoland are you from? JB: Glen Ellyn. Do you know the movie Lucas? That was shot in my town. That’s our big claim to fame. You can actually see my face in maybe seven frames of the movie during the big football scene. That was shot when I was in 5th grade, and I remember that having people come to my town, or rather the fact that these Hollywood guys chose Glen Ellyn, was a big deal for people in town. It put the spotlight on us for a minute, and we were so proud that these movie people saw the beauty in our suburban town. AVC: Did you see that happen in La Porte, too? JB: La Porte people responded in kind of a similar way. The process really helps people see their town through an outsiders eyes. Just today, someone posted on the movie’s Facebook something about how they “often forget how pretty La Porte is, and watching the movie reminds me to keep my eyes open and appreciate what we have here.” That wasn’t the intention of the whole movie, but if that’s something that happens as a side effect, I’m thrilled. AVC: What inspires you about the Midwest? JB: The Midwest is my home, and the movie’s really helped me appreciate where I’m from. The other projects I’ve done, like Found and Cassette From My Ex, aren’t specifically personal. Found’s about people and America, like “oh! The humanity!” La Porte, on the other hand, is really close to my heart, because while it’s not my town, it’s very similar to where I grew up—not physically, but in terms of how people relate to where they’re from. It’s funny how in Junior High and High School, kids can’t wait to leave town, but eventually people come to appreciate where they came from, and realize it might have been a really good town to grow up in. AVC: And where do you live now? JB: Brooklyn. But I’m moving back to Chicago in November. That’s the surprise for me about the whole La Porte process. I wasn’t intending for it to affect me so much, but when it did, I wasn’t shocked. JB: We spent seven weeks shooting, and every day people are talking about what it means to be from La Porte, and from the Midwest. My wife and I just had a daughter four months ago, and between the baby and the documentary, I really just wanted to go home to Chicago to raise my daughter. AVC: Are there specific Midwest things you miss? JB: I live a distinctly non-Brooklyn existence right now, in that we have both a basement and a backyard. One of my biggest joys is just mowing the lawn with this push mower we have. I just love it. I never thought growing up in the ’burbs would make me love mowing lawns later. It’s when I feel my most macho. JB: Chicago feels like family and home to me. No matter where I’ve lived, I’ve never given up my 773 area code. It was always in the back of my mind that I would go home eventually. AVC: What was your approach as far as what story you would tell with this movie? JB: After that first week where we did the pre-interviews, it became pretty clear what the movie would be about. The people were talking about La Porte being a graying industrial town, which is very present to them because people need jobs, always. Kids are leaving. La Porteans want to know how to become the powerhouse they once were, or if they can look for a potential heyday in the future. When Frank Pease took the photographs, the town had 30,000 residents. They’re at 22,000 now, so the town hasn’t disappeared by any means, but it’s definitely not what it once was. AVC: Did anything surprise you making the movie, other than how it affected you personally? JB: How direct people were was surprising, even if they didn’t know about the book. They were incredibly trusting of me and Joe. They also all made really good eye contact with the camera, which was the biggest surprise to me. It’s like they were all waiting around for someone to come tell their life stories. AVC: There are some total characters in the movie, like Jeff Dunk, a Vietnam war vet who owns Ye Olde Pipe Shoppe. JB: When we were there, everyone kept asking if we’d talked to Jeff Dunk yet. He’s the unofficial mayor of La Porte, which is a title I love. The regular mayor can come and go, but there’s only one unofficial mayor, always. Jeff’s story is both heartbreaking and awesome. He’s had so many problems in his life, but he still manages. If you want to know anything going on in town, he’s the one to talk to. We had no idea what to expect with Jeff prior to meeting him, and when we walked into his house, it blew our minds. Every inch of it is covered with memorabilia, like his life is documented on the walls. It’s a total callback to Found stuff. We have so much footage of his house it’s ridiculous. You’d ask him about a belt buckle and the next thing you know he’s telling you a story about how some county sheriff was involved in a back alley shooting. They’re little items with big stories. AVC: Are there people you wanted to include but couldn’t in the movie? JB: We’re just finishing up the DVD, and there’s about another hour of interviews and footage on the DVD as a bonus beyond the movie. So, that stuff will see the light of day. AVC: You feature people in the movie, like a homeless teen, who were never shot by Fred Pease. Why did you make that decision to go away from the book? JB: I think what we were trying to do was to see the parallel stories that are always happening. Like how similar things in the ’50s and ’60s are to today. AVC: One person in the movie makes the analogy that the town is like a stream that’s always moving. It always looks the same, but the water’s always different. JB: Yes! The stream analogy. You know, people are always still driving up and down the drag. The cars might be more souped-up and neon now, but that ritual goes on. They ride back and forth between the video store at one end of town and the parking lot at the other. You can have a ton of photos, but that kind of stuff makes a town a town. AVC: There’s another part in the movie where you guys are talking to an orchestra conductor who’s left town and lives in New York, and he says, “Am I remembering the way La Porte really was, or am I making a fantasy?” Do you think you can look at this town, and all those Frank Pease photos, and stay objective? Can you avoid nostalgia? JB: I’m very aware of how subjective my memory is. Like, I think I was a really cool guy all of my life, and I had a better sense of style than everyone else around me. With photos, I can go back and see how awkward I really was, and that my reality is not what everyone else sees. I think looking at photos can be very self-revealing. When I found those photos in the back of that café, it was just mind-boggling to think of who all those people were that you’d never met. You allow yourself to make up stories about them, but the movie actually tells those stories. AVC: Are you taking more pictures now? JB: I haven’t used a film-based camera in ages. All my photos are digital these days. I really don’t print them out. Actually, I do maybe three a year, but now I’m beginning to realize that having that physical object is really important. I’m trying to print things out to have them on my fridge instead of on my hard drive. AVC: So what’s your next project? JB: All my work keeps getting closer to home. Found was about Americans. 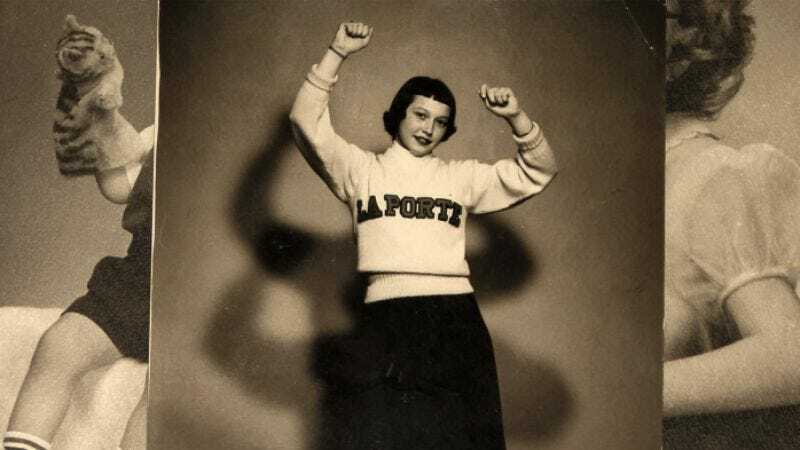 La Porte is about the Midwest. I’m going to have to do something about Glen Ellyn eventually. As far as firm projects, we have the Siskel screening and a Brooklyn screening. We have some PBS versions of the movie coming out next year some time. I’m a producer on this stuff, but making documentaries is a world totally unfamiliar to me. I’m casually dipping a toe in, but I don’t think my future is in films. AVC: Where do you see your future, if not in film? JB: I think my next project might be taking my family to get a Sears portrait taken. People crafting an image of themselves in a photo to share with grandparents and cousins, we don’t really do that anymore. When was the last time you had a professional photo taken? AVC: My senior portrait in high school, maybe? JB: Exactly. People our age have 3,000 photos on Facebook and Flickr, but no portraits. So that’s my next project. The Sears portrait studio at Woodfield Mall. November 1st. Be there.